The cone search load dialogue can be opened using the Cone Search button ( ) from the Load Window's toolbar or the Control Window's VO menu. It allows you to query one of a number of external web services for objects from a given catalogue in a given region of the sky. 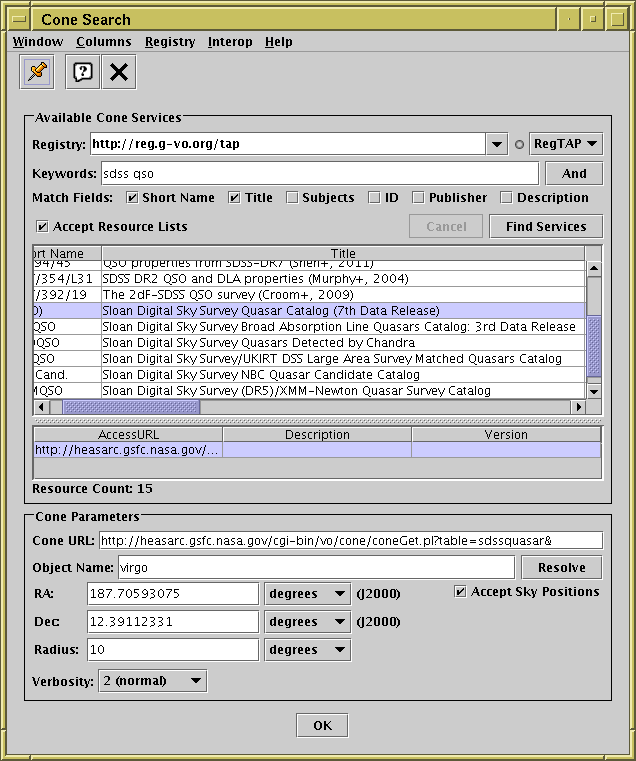 Data held by cone search services are effectively source catalogues with sky position columns. The window consists of a Registry Query Panel at the top, and a Single Positional Search Panel below. The search panel includes a Verbosity selector as well as the normal features: this allows you to choose options for how many columns will appear in the output table, from 1 (minimum) to 3 (maximum). Some services will take notice of this parameter and return narrower or wider tables respectively, and others will ignore it.